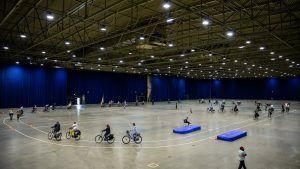 Last April, a large-scale cycling experiment was held in Ahoy Rotterdam as part of the ALLEGRO project to get insight into cycling behaviour. PhD candidates Alexandra Gavriilidou and Marie-Jette Wierbos are studying cycling behaviour on an individual and an aggregate level, respectively, and both encountered the problem of limited available data. Therefore, they decided to join forces to design and organise a large-scale experiment which would result in a large dataset of cycling movements that fits both research interests. With the help of associate professor Winnie Daamen, the researchers designed an experimental set-up with different traffic situations. The track layout consisted of two oval-shaped paths of 2m wide, which partially overlapped and it included a narrowing to create a bottleneck where cyclists had to reduce speed. This track design ensured that different types of behaviour could be studied, such as priority allocation when crossing or merging, congestion patterns at the narrowing. On straight stretches, cycling movements would be captured, covering overtaking behaviour and cycling in pairs. On the day of the experiment, in total 200 cyclists were invited to cycle for science in Ahoy Rotterdam. This location was selected for two reasons. First of all, the location needed to be indoors so a stable monitoring environment would be safeguarded, meaning no rain or light changes due to partially clouded weather. Secondly, the area needed to be sufficiently large to fit the track (100m x 40m) and the ceiling needed to be sufficiently high to enable the recording of cyclists from above. The participants were selected to create two groups. The morning group brought different bike types, such as electrical, racing and regular bikes, whereas the afternoon group consisted primarily of regular bikes. No other selection criteria was used, resulting in a varied group of participants between 17 and 89 years old. In total 8 cameras were connected to the 10m-high ceiling of Ahoy, covering the complete track. With a duration of the experiment of approximately 8 hours of cycling movements, the 64-hours dataset will enable Alexandra and Marie-Jette to come to many scientific insights in their future work. Already, before looking at the camera images, the effort of organising the experiment has led to a scientific contribution in bicycle research. A paper on the set-up and implementation of this large-scale experiment will be presented at 89th Annual meeting of the Transportation Research Board in Washington D.C. in January 2019.